Ever visited a film set? No? How about rafting on one?! Alongside Oregon’s picturesque Rogue River, John Wayne and Katherine Hepburn shot their 1975 film, Rooster Cogburn. And now these public lands can serve as your very own personal backdrop where you’re the star of a movie about hiking, rafting, exploring, and more! Sound good? Then let’s get ready for our close-up with this cinematic selection of new and historic photos from the Rogue River! The Rogue River is located in southwestern Oregon and flows 215 miles from Crater Lake to the Pacific Ocean. 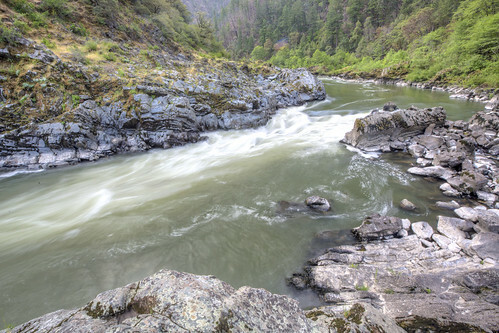 The 84 mile, Congressionally-designated "National Wild and Scenic" portion of the Rogue begins 7 miles west of Grants Pass and ends 11 miles east of Gold Beach. The Rogue was one of the original eight rivers included in the Wild and Scenic Rivers Act of 1968. The Rogue National Wild and Scenic River is surrounded by forested mountains and rugged boulder and rock-lined banks.